Finding the right kind of spectacles which your kid would enjoy wearing is pretty challenging. 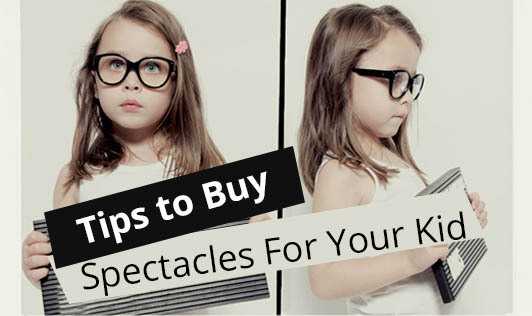 Follow these simple tips to buy the right pair of spectacles for your kid. • Consider your child's preference: Children are very self conscious about the way they look. They would not like to be teased because of their look by their friends in school. Let them choose their frame and if it is their choice, they would wear it without complaining. • Lens thickness: For vision correction, prescription is important. If your child's eye power is high, a smaller and sturdy frame has to be chosen to mask the thickness of the lens. • Metal or plastic: Children would like to mimic their parents or siblings. However, plastic frames are better for children. Metal frames suitable for children are also available. Ask your optician for hypoallergenic metal frames if your child is allergic to certain metals. • Nose bridge fit: Spectacle frames for kids are designed to fit their nose bridge. Plastic frames have fixed nose bridges while metal frames come with an adjustable nose bridge with comfortable nose pads. Your optician would help you choose a frame that won't slide down the nose. • Temple style: Temples that would wrap around the ear will ensure that the spectacle will not slide down your child's face. The regular temples which curve behind the ear would be a better choice for your kid. • Spring hinges: These hinges flex outwards, away from the frame without causing any damage. Kids are not usually careful while wearing or removing their spectacles. Spring hinges help preventing such costly damages. • Lens material: Plastic lenses would be a wise choice as they are light weight and safer as compared to glass lenses. Polycarbonate lenses which are high impact resistant and come with inbuilt UV protection that would be best for children. If your child's power is high, then it is advisable to have a pair of spare spectacles which would come to use in case of repair or if he loses it. Make the right choice that will keep your child comfortable and make him look his best!